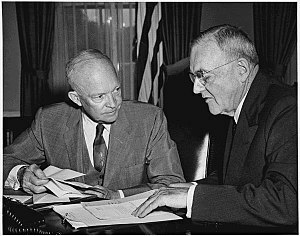 Achieving a balanced budget was a priority for Eisenhower, despite the Cold War and despite calls for tax cuts. And since the defense budget was the largest component of the Federal Budget, Eisenhower was determined to get it under control. Unlike many military men of the past, he understood the need to prepare to fight the next war, not the last one. As he expected, Eisenhower received pushback from many quarters, from the Army, the Navy, from Congress on the closing of bases, and even within his own administration. When his Secretary of State John Dulles protested that the priority for a balanced budget would put the country at risk Eisenhower disagreed, once again telling his cabinet that security required a sound economy, which required a balanced budget. For the rest of his Presidency, Eisenhower stood firm against pressure from the Pentagon, Congress and others to increase defense spending in his goal to achieve the balanced budgets required for a sound economy. In his first Federal Budget for 1955 he was able to reduce overall defense spending from $48.7 billion in 1954 to 44.9 billion. In three of his eight years in office, Eisenhower managed to deliver a small budget surplus (1956, 1957, 1960). The country did go through two recessions during his administration, one he inherited in 1953, and the other in 1957. But overall, the economy thrived under his leadership. America had the strongest economy in the world in the 1950s. Business and manufacturing thrived, with exports at all time highs, and U.S. GDP grew from $284.6 billion in 1950 to about $500 billion by the end of the decade. The country prospered in large part because of Eisenhower’s leadership and insistence on the proper allocation of resources and fiscal responsibility, especially his resistance to increase defense spending and reducing taxes.